I love coffee. I have drunk it all over the world, from England to Austria and from Canada to India. I drink it wherever and whenever I can. But I rarely drink coffee in cafés or restaurants in the UK. I refuse to go to one of the trendy high street coffee bars that have sprung up during the past decade and pay the equivalent of at least 160 rupees for a small cup. They serve coffee from all over the world and the aromas are beautiful, but the catch is that the customer pays through the nose. A second catch is that you are sitting in world, designed by consumer analysts, where the décor is very carefully (some would say, cynically) selected to entice, manipulate and make you part with your hard earned cash. The big coffee house chains are beginning to dominate the world. They are loved by those who want an expensive cup of coffee in the morning, and hated by anti-globalisers and those who despise the homogenisation of cafe culture. All is not yet lost however as traditional coffee houses still thrive and offer a better experience. In places such as Austria they have existed for decades and a part of the fabric of a town or city. The coffee blows your head off! I recall visiting a coffee house in Vienna and was given a thimble-like container of black coffee. Although I was highly disappointed with the quantity, after one sip I realised that this was no ordinary strength coffee. It was the super-concentrated type, of rocket fuel strength. Decent if rather strong coffee served in a coffee house that had been part and parcel of the local community for generations. The Kaffeehäuser of Vienna have more in common with Parisian literary cafés or English pubs than they do with modern espresso bars that serve latté in paper cups. Both are from different worlds. And then from quite another place entirely there is McDonalds, Burger King and all of those fast food joints that serve coffee by the bucket (or should that be from the bucket?) in paper cups. Somehow drinking coffee from a paper cup in a fast food place doesnt feel quite the same as drinking coffee in a Viennese coffee house. It doesnt taste the same either. Sadly, these days those traditional houses are facing strong competition from McDonalds and the rest. After having sampled the delights of coffee around the globe, I have come to conclude that there is only one place to drink it: India. 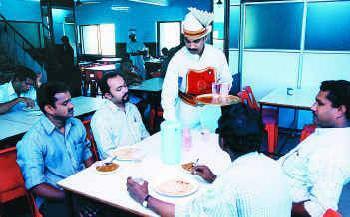 And there is only one establishment to drink it in  the Indian Coffee House. There are around 160 branches throughout the country. Ive visited branches in Shimla, Allahabad, Pondicherry, Calcutta, Trivandrum and many places beside and have never been disappointed. Whenever I visit a new place, one of the first things I do is find out whether there is an ICH in town. Black and white framed photographs of Nehru, Gandhi, and Indira Gandhi usually adorn the walls of each ICH and the waiters are dressed in shabby, white (well whitish) uniforms. They are pretty basic places where the decor generally takes a back seat to the low prices and delicious dosas and masala dishes on offer. Things are cheap and simple in the ICH. Unlike the new, trendy coffee bars now in India, there is no long and winding menu of coffee types to choose from. There is no need to confuse your latte with your cappuccinos or your macchiato with your _mocha. Coffee comes as coffee, no frills, no fancy names. And its absolutely delicious. For four or five rupees per cup, you can't complain. Each ICH seems to have its own clientele. Depending on which branch you happen to be in you may be rubbing shoulders with vacationing families, lawyers, students or men who sit at wobbly tables on wobbly chairs, hiding behind newspapers and discussing the issues of the day. And each ICH has its own distinct character. For example, the one in Trivandrum, near the train station has good food served in a strange leaning-tower-of-Pisa-like spiral building. Others however can be a bit dingy and dont have most of the items on the menu. The elaborate head-dress on the waiters is a usually a metaphor for the type of service on offer: clean, starched and upright or limp and ill-fitting. But one thing is always guaranteed: the fare will be excellent. ICH Coffee House Unlike the trendy Starbucks, Café Nero or Costa coffee bars in the West, traditional coffee houses possess a certain authenticity. That's what I like about the ICH. It operates as a workers co-operative and is unmolested by the cynicism of the corporate world. And for better or worse, it shows. Maybe its a place trapped in time. But its a place in time that I prefer.